CAMBRIDGE, Mass. 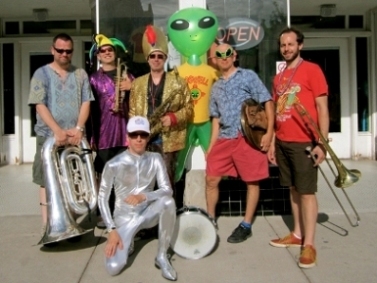 - Oct. 9, 2014 - PRLog -- Revolutionary Snake Ensemble Halloween Show, with special guest Jon Bernhardt on theremin. Friday, October 31, 7:30 pm. Tickets: $20. Regattabar at the Charles Hotel, One Bennett Street, Cambridge, MA 02138 . For tickets and information: 617-395-7757, www.regattabarjazz.com. After crowd-stunning performances this summer at the UFO Festival in Roswell, NM and the Festa del Redentore in Venice, Italy, New England Music Awards nominee Revolutionary Snake Ensemble (RSE) returns to Regattabar for a costumes-optional Halloween throw-down! RSE's leader Ken Field (sax) will be joined by fellow Snakes Jerry Sabatini (trumpet), Tom Hall (sax), Dave Harris (trombone & tuba), Phil Neighbors (drums), and Blake Newman (bass). Formed in 1991, RSE is a funk & street beat improvisational brass band performing a unique blend of original and traditional music. Leader Ken Field is a longtime member of the acclaimed modern music ensemble Birdsongs of the Mesozoic, and an active composer and performer. RSE has performed at the Kennedy Center for the Performing Arts, the Brooklyn Academy of Music, Tipitina's, the Museum of Fine Arts Boston, and many other venues. Notable guest musicians who have appeared with RSE include Charles Neville, Trombone Shorty, Kenny Wollesen, Matt Darriau, and Josh Roseman. Guest musician Jon Bernhardt has been playing theremin since 1996 with such bands as The Lothars, The Pee Wee Fist, and UV Protection. As a solo performer, he specializes in theremin versions of songs that are completely inappropriate for that instrument, although he's been known to throw in a few standards to keep the audience on their toes. When not playing the theremin, he DJs an indie-rock radio show at WMBR-FM in Cambridge. web.mit.edu/jonb/www/"
who does and then takes it in fascinating directions."